Behind behind the counter of the Bind-it-All booth allowed me the best view of the epitome of CHA - the excitement of new products, great deals and FREE stuff! The crowd never diminished for long and the line to order often wrapped back around the booth! It was so much fun to show people these tools and watch their faces light up with the possibilities the Bind-it-All and Dreamkuts would give them creatively. Demonstrating the tools also gave me a lot of practice with them and now I have a ton of ideas in my head that I just need to find the time to create! Fun stuff for us! 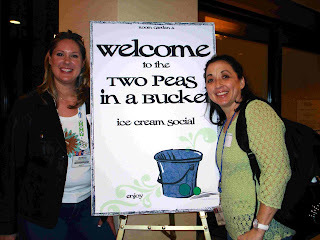 We rolled in to the Two Peas reception at the Sheridan Hotel a few blocks from CHA central (aka Anaheim Convention Center) to check out our fellow Peas from www.twopeasinabucket.com. Nan seriously needed some cold ice cream for her sore throat - she had been demoing the new Zutter products all day and needed some relief! I'll be honest - I just wanted something sugary and sweet. We met fellow Pea Bran, aka dontdropthespiritstick on the Pea message boards. She's a mom to two cheerleaders, hence the "Bring It On" inspired handle. We stayed for the first drawing ... I was lucky number 13. It was lucky, but not quite lucky enough - because 113 was the big winner! No joke, Zutter Industries had the busiest booth at CHA on Sunday. Sure, there were bigger names with bigger crowds - but only when that booth had scheduled a drawing for some big prize. Zutter, who manufactures the first do-it-yourself wire binding tool, Bind-it-All, had continuous crowds around its booth simply because the tool is like nothing else on the market right now - and I had the pleasure of assisting the Zutter team with marketing tools and project samples. Zutter has also introduced new paper cutter, DreamKuts, that allows you to make perfectly matched minibook pages in a matter of seconds. Learn more at www.binditall.com. 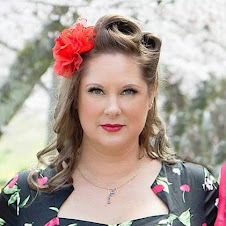 People were gathered around the booth, ordering the two tools, binding wires and chipboard minibook starter kits, With every order, retailers would also get a baby pink robe with the Bind-it-All logo on it and a vintage valise-styled rolling suitcase. For me, it's awesome to have three of my projects on the side of the Bind-it-All box. The red and blue box, vintage tag book and "Precious" envelope book are mine. And my scrappy friend Nan not only demoed the tools at CHA with me, but she also has two projects on the box (which they mislabled, by the way!) The marching band memory book and the Miami Dolphins fantasy football league journal are Nan's designs. Not bad considering we hadn't ever seen, much less touched, the machines when we made them! We just knew the machines' capabilities and created projects for the instructional DVD that is packaged with each machine. 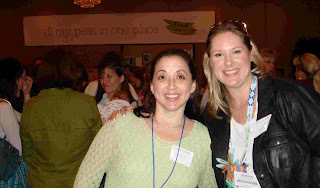 You may have seen it - it was playing at Angel's Scrapbook Garden in Mission Viejo and at the CHA booth. And that instructional DVD holds a special place in my heart ... I coordinated the production of it. Anyone need a video made? Have you people call my people ... ha! Can I just say I had WAY too much fun? For most of the morning I was frantically demonstrating the new Bind-it-All and Dreamkuts machines at the Zutter Industries booth (see next post) but when I stole away for lunch I saw some great things! ProvoCraft is coming out with a 12 x 24 inch Cricut Expressions - they just didn't say when. Still no news on the USB port and compatibility with PCs (bummer) but I am still waiting - and none too patiently! Plus, they were celebrating tbe 10th anniversary of the Coluzzle system, with the founding husband and wife team present and handing out free balloon template packages, complete with foamy mat and knife. I did a couple of make and takes, one of which from Prima flowers. Nothing too exciting (use a Crop-A-dile to add brads to the flower petals and Prima is now coming out with HUGE brads)but I can see why stores buy up Prima like crazy. the sale reason croppers buy it up - the cute packaging. Only at the show, I saw the entire lines all together. It reminded me of when I collected My Little Ponies (the originals! Not these new-fangled things with glitter and jewels) because I wanted one in every color! Deja Views had a cute make and take, a mini book with either a girl or boy theme. One sheet of 12 x 12 had all of the pieces you needed to complete it, with the exception of ribbon and brads. While the first day of the annual Craft and Hobby Association show is officially tomorrow, there was plenty to see and do today! I took two classes, one sponsored by EK Success and another sponsored by C and T Publishing, or Create and Treasure Publishing. My second class was sponsored by C and T Publishing, which I had never heard of before. They publish books, magazines and other catalogs, as well as manufacture some great chipboard books, such as the one we made the tag book out of. Artist Lea Cioci taught the class and pitched her new book C and T published(It would have been nice to get a copy of it in class). The tag book has some great techniques involved with it using Ranger ink, Gildenglitz, texture sponge and double-sided sheets of adhesive by Grafix, among others. Both classes were a little more than classes, say, at Expo, but at $25 each, they were also a step above any other classes I've taken, especially the one from C and T. I left with great product knowledge and even learned some fresh new techniques I can use in my class projects. Since I am also helping out Zutter Industries with their introduction of the Bind-it-All and Dreamkutz (www.binditall.com), I was able to walk around the exhibitor hall early. There were definitely some companies that were better prepared than others. Some of the booth that were already up and had a sense of calm to them were Xyron, Ellison (Sizzix), and Die Cuts with a View. There were definitely some major brands whose booths were clearly not close to being ready with staff running around like chickens with their heads cut off. I'm anxious to see how it all looks tomorrow! Thanks to CHA bringing the native New Jersey crew to SoCal, the Junkitz gang stopped by Angel's Scrapbook Garden for a sneak peak at some of their newest stuff! 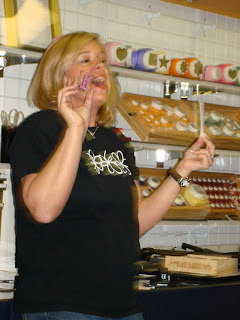 We also got some demos from Junitz owner Stacey Panassidi herself. There were some great ideas: Using acrylic paint as adhesive for transparencies, using chipboard to add dimension to mounted photos and so much more. 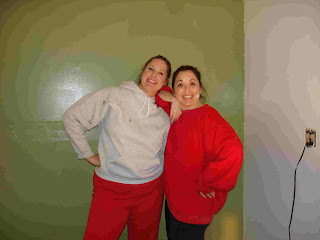 They proudly showed off their newest lines they are debuting at CHA this weekend. And the sample projects were incredible. A very talented staff used product designed by the likes of Teresa Collins and Tim Holtz to make some great items. I especially enjoyed the metal Pirate album - my 4-year-old is into pirates and will probably want a pirate birthday party. This would be a great minibook for the party pics! Anyway, all of the projects were created by the Junkitz staff, but I'm sure they'll be scraplifted plenty! While there wasn't a make n take (bummer)or a goodie for everyone to go home with (double bummer), three of the 16 ladies present at Angel's free event went home with product valued at more than $50. 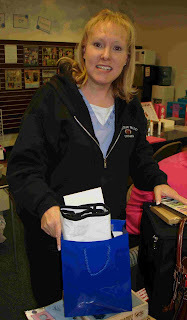 First prize went to lovely Lisa, who rarely gets to win anything since she is always WORKING the events! So, congrats to her! I can't wait to see what she makes with all of her new stash of Junkitz stuff! Wanna know more about Junkitz? Visit their ultra-hip Flash site, www.Junkitz.com. I promised myself that THIS year I would enter Creating Keepsake's Hall of Fame contest. I've wanted to for years, attempted to two years ago, but never got finished. This year I PROMISED!!! But then my hubby built me a scrap room I have to organize. And then I said I'd go to CHA (arm twisting was necessary - ha!) and then more stuff that I won;t bore you with. Basically, life is getting in the way of my crop time! And the Feb. 10 deadline is LOOMING! Because I not only have to be done with my layouts by then, but I have to organize it the way they want which you'd think would be easy, but it's very detailed - but not very clear with the details. And it sounds like any little thing could knock you out of contention. So, I'm desperately trying to find some crop time to get this done so I can meet my GOAL! (I'm very goal-oriented as anyone who's known me for 5 minutes can attest!) So, please, wish me luck! Two weekends ago my DH surprised me by building a "portable" scrap room in the garage. With the help of friends Nan and Peter, the scrap room came complete with 64 feet of floor space, drywall and a door that LOCKS to keep would-be scrap theives out of my stuff - ha! Oh, and a pea green accent wall. Not quite the color I had in mind, but apparently the lights in Home Depot aren't what you would call "true." What was supposed to be a dark sage turned out to be baby food pea green. Solution: Cover the wall with scrap stuff!!! 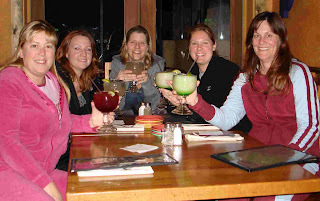 During our crop in El Segundo, the ladies and I headed to the local Cozumels for some dinner - and margaritas of course! I recommend the sour apple! This is awesome! Wire-bind your own mini books! 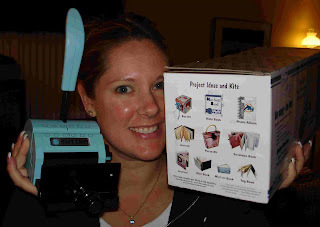 There is the BRAND NEW scrapbooking tool that I have had the pleasure of using and it's a small, portable machine that allows you to punch through chipboard, cardstock, CDs, credit card-thin plastic and very thin sheets of metal, among other things. I've been wanting to find a way to bind my own mini books and it's finally here! Basically, you won't need to buy any more plain wire-bound books to embellish - you can make your own! It's going to be unveiled at CHA to retailers, but the company is taking preorders from scrapbookers themselves NOW! Want to find out more about the machine? Visit www.BindItAll.com - but if you want to get your machines before the CHA orders get in, or of you have other questions, email me at www.jessicaguthrie@hotmail.com. Fabric Barn appears to mainly serve wholesalers (and these clients must have a wholesaler's license); however, between the warehouses is an outlet retail store that isn't much to look at from the outside. But inside ... Let's just say if you are looking for a specific type or color of ribbon you will probably find it here. Head into the back half of the store to find spools and spools of ribbon - I won't even try to guess how many. Most are hung comfortably at eye level, clearly marked with prices and cutting directions. It's based on the honor system, you cut your own ribbon using very accessible yard sticks and scissors, writing down your selections on the provided pads of paper. Prices, for the most part, seemed great. Specialty ribbons and ribbons in the designated "Scrapbookers" section (Fabric Barn saw us coming a mile away!) are generally discounted, especially when you compare the prices to those at most LSSs. Most ribbons in these sections are 2,3 or 4 yards for $1, depending on the design. I am usually charged at least 69 cents a yard, or more, for the EXACT SAME ribbon at local LSSs. At Fabric Barn, if you need the entire spool, an even deeper discount is given. However, thin, 1/4-inch ribbons such as the Offray ribbons you can get at Michaels or JoAnn's aren't much of a bargain at all. They are actually just as much or more that they would be on sale at the box stores. My advice is to wait for the sales at the box stores and save your Fabric Barn money for tougher-to-find selections. The following ribbon themes were well-represented at Fabric Barn: Sports, pets, wedding, baby, holidays (Christmas, Easter, St. Patrick's Day, Valentine's Day, Mother's Day and more) baptism/faith, seasons (especially fall) and floral. Be sure not to miss the bargain box of spooled ribbons in front of you just as you walk through the front door. You might discover a hard-to-find color at a cheap price! (I got 50 yards of a 1/4-inch aqua I hadn't seen before for a mere $1.99, plus tax). For less than $18, I got the 50-yard spool (which I will end up sharing, I'm sure! ), 13 yards of 6-inch wide black tulle, and 40 yards of different specialty ribbons of my choice. I left many great ribbons behind for the next time I visit. You can even order personalized ribbon, printed with whatever verbiage you want. Go to Fabric Barn's website (click on the title of this post) for details. Aside for ribbon, there is also lace, cable, tulle, trim, elastic, Velcro, batting, pillow forms and a limited amount of fabric. Woodcraft, dollmaking and other craft supplies are available, as well as party decorations and favors in nearly every one of life's themes (wedding, birthday, baby, holidays, etc.). As I mentioned before, this is definitely a store I will visit again ... whenever I have a spare $20 and an urge to add to my ribbon collection! Good News: I get to crop the weekend away in a hotel with scrappy friends! Judy's weekend filled up with, well, LIFE, and she had too much to do to be able to enjoy herself at the A to Z Scrapbook retreat this weekend, she said, and the kind woman thought of ME! I had wanted to go, since I had gone the past two years in January, but $$$ is a little tight after the holidays. So I resigned myself to not go and stay home with my DH. Not such a bad proposition since it would just be the two of us (the kids are visiting their grandparents in Illinois for the month.) But, then Judy called last night and whoo-hoo! I'll get some much-needed scrapping done! And on my OWN pages! Not for a class to teach, not for a goft to give away, but MY stuff! I hope my weekend is as productive as I hope it will be! And the hubby can come and visit if he REALLY gets bored - ha! Scrappin' Times seemed to be all about customer service! I was greeted the moment I stepped through the door, asked twice if I need help during the half hour I was there and the staff went to extra lengths to look for a certain item for me. Not only that, but a handful of individual "regulars" were greeted by their first name by the staff throughout my visit. Obviously, Scrappin' Times is a store that cares about their customers. The store is large, organized and labeled by theme and has a vast selection of product, including product I hadn't seen at other stores. Seasonal Valentine's Day product was up front and easy to find. There was a nice Las Vegas tourism section toward the back of the store. One member of the staff saw me looking at it and brought out some new product that hadn't been priced yet so I could sift through it - another example of excellent customer service, as well as a simple way for the store to get me to spend a bit more money maybe! Paper was displayed on shelves, making it easy to see. However, it also slid off the shelves easily when you tried to put it back - bummer. It appears that the buyers for Scrappin' Times purchases entire lines. But they were out of several of the popular collection packs offered by the companies. There were a fair amount of classes with cute projects, but the crop area was a bit on the small side. Scrappin' Time also had some fun and fabulous promotions that were different (60 second shopping spree, anyone? How about a double punch day for your frequent buyer card?) and seemed to get a lot of participation from the patrons. Majestic Memories is BUSTING out of it's building! It's a good thing they are moving to a larger store in March! Most of my "bummers" were based on organization and size: Very small crop room, 7-foot shelves with product higher than most people could reach and narrow aisle that made shopping difficult. However, it sounds like many of these items will be remedied with the move to a building 5 minutes away from it's current location. One bummer that I hope changes is the labeling of sections - there is none. For the practiced scrapbooker, it was obvious that most of the store was organized by theme, but you would have to ask or hunt around for the theme you were looking for. And beginners would probably have just walked around in a claustrophobic trance, not knowing what they should be looking for - or at! However, there were definitely upsides! Customer service was great. I was greeted immediately and effectively helped when asked. Seasonal Valentine's Day product was right up front, as was a Las Vegas Tourism section. In a stroke of what I think is genius was the clearance section, right at the register, so it would be easy to see a discounted item and quickly add it to your order (before you had time to talk yourself out of it, of course!). If you are a big fan of QuicKutz, Majestic Memories is the place to go! There was a large selection of dies and, after overhearing a conversation between a group of store "regulars," Majestic keeps on top of the newest ones. There is also a large selection of textured papers made out of different media, such as fabric, faux snake skin or basketball-like texture. A peek at the calendar showed an extensive list of upcoming classes for all skill levels. Most of the projects were incredibly attractive and looked to be worth the cost. The crop area was large, well-organized and made me want to sit down and get to work. Pebbles is an easy drive from the north end of the strip and, although on the second story, is easily accessible via stairs or elevator. The only bummer was that the customer service seemed to be lacking. I was never greeted by any of the three employees, nor asked through my visit if I needed help, even though I was the only customer for a period of time.